The Bell-Beaker culture (or Beaker culture, Beaker people or Beaker folk) is the name of a cultural phenomenon which occurred in large parts of Western Europe, roughly between 2800 BC and 2200 BC (in Great Britain until about 1900 BC). Today, it is unclear whether this can be seen as a culture. Paul Reinecke was the first to use the word Glockenbecher (bell-shaped cup) in German, around 1900. Other historians from Italy and Czechoslovakia had used similar terms before. Gordon Childe thought that the people were missionaries, who also had the knowledge how to make copper. 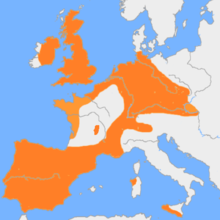 They spread from the Iberian peninsula on the edges of Europe with the oceans. The typical items linked to the movement were prestige items reserved to the upper class, according to Steven Shennan. Christian Strahm talk about a Glockenbecherphänomen (bell-shaped cup phenomenon), to avoid the word culture. Men's heads faced north, feet south; extremities faced left. This means that both looked east, when buried. Today, little is known about the settlements used by the culture. The only places where settlements/remains of settlements that were done at approximately the same time were found is in Knowth in Ireland, and one in Switzerland. Another culture that might have influenced the Beaker culture is the Corded Ware culture, mainly found in Northern Europe. This page was last changed on 14 April 2013, at 15:48.